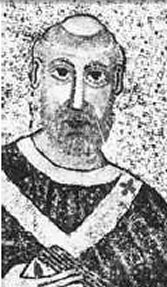 Pope Saint Cornelius, also known as Cornély, was pope from his election in March 251 to his martyrdom in June 253. The most prominent feature of his papacy was the rivalry of the antipope Novatian, who was elected in opposition to Cornelius' relatively lenient policy in accepting back into the church those who had apostatized during the recent persecution under Emperor Decius. Cornelius was elected after a vacancy in the office of the bishop of Rome of nearly a year due to the persecution, during which time a controversy had emerged in many churches regarding how to treat those whose faith had wavered under pressure. Cornelius and his ally, Bishop Cyprian of Carthage, favored a policy of forgiveness, while the respected and scholarly churchman Novatian insisted that only God could forgive the most serious post-baptismal sins. The schism spread throughout the Roman Empire and would last well beyond the deaths of both Cornelius and Novatian as martyrs. Several of Cornelius' letters are preserved, in addition to many letters to him from Cyprian. Besides documenting the early stages of the Novatianist schism, these provide evidence that the Roman church had become a sizable institution by the mid-third century, to which other churches increasingly looked for guidance as the "seat of Peter." The policy toward lapsed Christians adopted by Cornelius with Cyprian's support would set the standard for the later Catholic theology of a "universal" church as a ministry to lifelong sinners as well as saints. Cornelius later became a figure of veneration, especially in Germany and France. The contemporary feast day of Saints Cornelius and Cyprian is celebrated joint in the Catholic Church on September 16. According to the Liber Pontificalis, Cornelius was a Roman by birth, and his father's name was Castinus. His predecessor, Fabian, died, probably in prison, under the persecution by Emperor Decius on January 20, 250. By the beginning of March, 251, however, the persecution slackened, owing to the absence of the emperor, against whom two rivals had arisen. Decius had especially targeted the Roman church's leaders, and the office of the Roman bishop had thus remained vacant for more than a year. Now, under conditions of at least temporary safety, Cornelius was elected pope on either March 6 or 13 of 250. His election, however, was a contentious one. Ever since the appearance of the first antipope, the future Saint Hippolytus, c. 217, the Roman church suffered from internal division over the issue how to deal with serious post-baptismal sins. The recent persecution brought this issue again to the fore, especially as pertaining to the sin of apostasy, since many of those who had recently compromised their faith in order to save their lives now sought readmission to church. Cornelius' election was therefore opposed by Novatian, who maintained the view that not even the bishops could grant remission for grave sins such as apostasy, murder, and adultery. He held that these could only be remitted at the Last Judgment. Cornelius on the contrary believed that bishops could indeed grant absolution for these sins. Another issue which divided them seems to have been remarriage, which Novatian opposed. According to the contemporary writings of Cyprian of Carthage, 16 bishops were involved in the election of Cornelius who, out of humility, initially resisted their decision. Cyprian also claims that Cornelius was elected by the consent of nearly all the clergy and the congregation of Rome (Cyprian, Ep. lv). However, this testimony cannot be accepted at face value, since Novatian succeeded in having himself elected by his own rival constituency, which included at least three bishops who consecrated him as pope as well. A man of significant learning who had acted either as archdeacon or secretary for the Roman church, Novatian's schism proved to be a long-lasting one which established congregations in many parts of the empire, and with which not only Cornelius, but several succeeding popes had to contend. Cornelius and Novatian both sent messengers to other churches throughout the empire to announce their respective claims. Cornelius' papacy was supported by a synod at Carthage, and Bishop Dionysius of Alexandria also took his side. However, Cyprian admits that Novatian "assumed the primacy" (Ep. lxix, 8) with some degree of success, sending out his disciples to many cities to set the foundations for his new establishment. He was able to command the loyalty of numerous church congregations, with consecrated priests and bishops to lead them (Ep. lv, 24). Both rival popes appointed new bishops where the existing one was loyal to their opponent. Among the churches which are known to have developed rival congregations during Cornelius' time were Antioch, Caesarea, Jerusalem, Tyre, Laodicea, Tarsus, and virtually all of the the churches of Cilicia, Cappadocia, Syria, Arabia, Mesopotamia, Pontus, and Bithynia. Meanwhile, before the end of 251, Cornelius assembled a council of 60 bishops from Italy or the neighboring islands, in which Novatian was excommunicated. Other bishops who were not present added their signatures, and the entire list of those denouncing Novatian was sent to the principal churches throughout the empire. Portions of three letters from Cornelius were were preserved by the fourth-century church historian Eusebius of Caeasria (Church History VI.43). In these writings, Cornelius details the faults in Novatian's election and conduct with considerable bitterness. The letters also provide important historical information about the Roman church itself. Cornelius claimed that under his administration there were 46 priests, seven deacons, seven subdeacons, 42 acolytes, and various other functionaries. He also wrote that the church cared for over 1,500 widows and other persons in distress. On the basis of these figures, some historians have estimated the size of the Roman church at this time to be as large as 50,000, while others believe this figure is much too great. Two of Cornelius' letters to Cyprian have also come down to us, together with nine from Cyprian to the pope, thus making Cornelius' papacy one of the most well documented in the early church. The correspondence with Cyprian indicates that the pope supported the Council of Carthage's decision to restore to communion those who had turned away from the faith during the Decian persecution. The letters of Cornelius, to the extent that their original language can be known from existing copies, seem to have been written in the colloquial "vulgar-Latin" of the day, while those of Cyprian are in the more classical style. The issue of erudition may have proved an advantage to Novatian, who was known as both a philosopher and an orator. At the beginning of 252, a new persecution suddenly broke out. Cornelius was exiled to Civitavecchia, northwest of Rome. Cyprian, perhaps exaggerating, declared that there were no defections among the Roman Christians during the persecutions. The pope "led his brethren in confession," he says, and "with one heart and one voice the whole Roman church confessed." (Ep. lx) Cornelius died a martyr in June 252, although it is not clear whether his death resulted from the difficulties of his banishment, or, as in later accounts, by being beheaded. The inscription on his tomb reads "Cornelius, Martyr." The close association of Cornelius and Cyprian led to the tradition that, in Rome, the feast of Saint Cyprian was kept at the tomb of Cornelius. Their feasts were also celebrated together on September 14 (later moved to September 16), which may be the day on which Cornelius' remains were transferred from his place of death to the catacombs. Novatian, for his part, fled Rome, but he too eventually seems to have become a martyr several years later. His followers successfully maintained their separate identity from the Catholic Church for many years. The standing stones of Carnac in Brittany were once thought to have been pagan soldiers who were turned into stone by Pope Cornelius. The decision faced by the Roman church in the time of Cornelius was a truly momentous one, determining the character of Catholic Christianity as a "universal" church for sinners as well as saints, as opposed to the Novatianist model of a holy church of saints who were willing to die for their faith and must absolutely refrain from major sins. This "holy vs. catholic" theme would play out several more times throughout the centuries. In the Roman Catholic Church today, Saint Cornelius is commemorated along with Saint Cyprian in a memorial on September 16. In iconography, Cornelius’ attribute was the horn, in reference to the Latin origin of his name, from cornu, or “horn.” Some of his relics were taken to Germany during the Middle Ages; his head was claimed by Kornelimünster Abbey near Aachen. In the Rhineland, he was also a patron saint of lovers. A legend associated with Cornelius tells of a young artist who was commissioned to decorate the Corneliuskapelle in the Selikum quarter of the city of Neuss, across the Rhine from Düsseldorf. The daughter of a local townsman fell in love with the artist, but her father forbade the marriage, remarking that he would only consent if the pope did as well. Miraculously, the statue of Cornelius leaned forward from the altar and blessed the pair, and the two lovers were thus married. Cornelius, along with Quirinus of Neuss, Hubertus, and Anthony the Great, was venerated as one of the Four Holy Marshals in the Rhineland during the late Middle Ages. 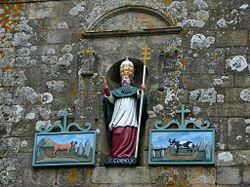 He was also a patron saint of farmers and of cattle, and was invoked against epilepsy, cramps, afflictions associated with the nerves and ears. 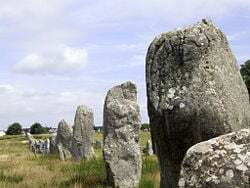 A legend told at Carnac on the south coast of Brittany in northwestern France states that its standing stones were once pagan soldiers who had been turned into stone by Cornelius, who was fleeing from them. This article incorporates text from the Catholic Encyclopedia, a publication now in the public domain. This page was last modified on 21 June 2013, at 14:27.